After a busy Spring racing calendar, the month of May has come around fast and with it the Giro d'Italia: the only three weeks of the year when stage racing can actually be unpredictable and pink looks cool on blokes. Yes indeed because, lining up with at what should be his first serious attempt at Il Giro is Chris Froome but, as things stand, if his name should be inscribed on the trophy here it may yet have to be scratched out. GT titles have been removed before, of course, but what makes this situation so risky is that, for the first time in our sport's history, we already know in advance that the possibility is real and significant. Within a few weeks from now, it may well turn out that the only thing Froome will have beaten is a metaphorical egg with his ridiculous cadence. And, as if that were not enough, there's also the matter of the host town paying for the Grande Partenza. As if it wasn't enough for some idiots to move their embassies there, they also had one of the biggest pro cycling races set off from there: Jerusalem. Some might say that there's no place for (geo)politics in our sport, others are doubtless excited by the piquancy of potential danger, but let's hope that the sword shall indeed sleep in the hand. 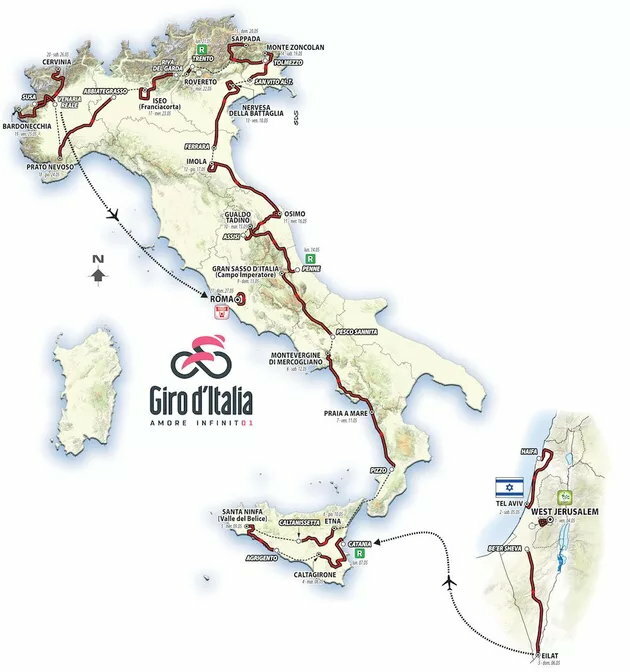 Together with the opening ITT, along the route of which we might expect to see more security staff than spectators, there will be two further stages in Israel before the caravan decamps to the island of Sicilia, more familiar scenery and the first big test on Mount Etna for Stage 6. Cutting north through the mainland to the Veneto, the peloton will arrive in the Dolomites with the second-week crescendo of a long 14th stage to Monte Zoncolan. There's no respite as the race takes in a tough ITT before heading into the Alps for the showdown of the final week. - 2017 winner Dumoulin returns with a strategy which can be summarised as "defending without defecating". No Kelderman for support this year. - the boys in baby blue look to be backing the diminutive Lopez with a bunch of stage hunters. - Pozzovivo looked sharp lately and this year he's here as no second fiddle to pull all the strings. - Pinot returns to Italy as his happy hunting ground but he has two ITTs to deal with. - Wellens is the headliner and Hansen further extends his record of GT starts. - Chaves if he's good enough; Simon Yates if not. - It's all about Viviani and perhaps a walk-on part for Gaviria. - Woods will find out how many matches he can use over three weeks without getting burned. - Froome and seven more. - Aru will fly straight on the climbs but may miss the target in the ITTs.